Barrel shaped Sterling Silver real polished Wood set Pendant. Designer pendant with puzzle Maze shapes wood inlaid in Sterling 925 Silver. Sterling Silver sliding curve design pendanet inlaid with genuine polished wood. Curved shape Sterling Silver pendant inlaid with 3 pieces of polished genuine wood. Triple organics wood set designer Silver 925 Pendant. Long 34mm Sterling Silver Pendant inlaid with real Wood detail. Organics designer wood inset Long Silver drop Pendant. Elegant design ZIG ZAG style Sterling Silver pendant inlaid with polished finish pieces of selected genuine wood. Sterling Silver Beads set with Glittering Cubiz Zirconia Stones. Sparkle CZ set Silver Bead 10mm size. 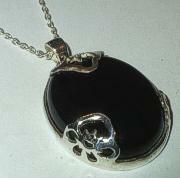 Fancy design Sterling Silver Oval Black Onyx stone Pendant with 410mm Sterling Silver Chain. 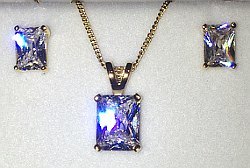 Large Multi Coloured 8 Stone set Sterling Silver Elegant Pendant on Necklace 410mm Chain. Sterling Silver Double drop Pendant set with Cut design Dark Stones including 18inch (460mm) solid Belcher Chain, plus pair of Cut Dark Stone set Silver Earring Studs. 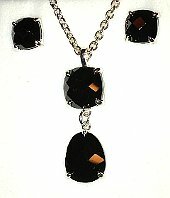 Complete jewellery matching Set Dark Stone Pendant and Earrings. 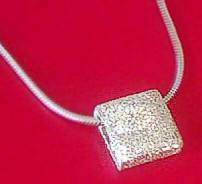 Large rectangular CZ stone Sterling Silver pendant. 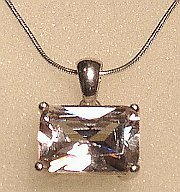 14mm x 10mm Cubic Zirconia solitaire Pendant. 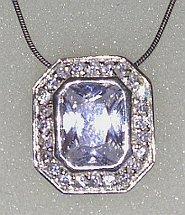 Sterling Silver pendant set with sparkling CZ stones around outside and cut CZ larger Lilac stone in the centre. 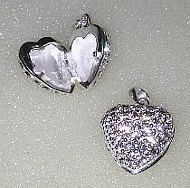 Sterling Silver Heart CZ encrusted Pill Box Pendant.